Warning: Each web version of an ASOP is provided “as is” for convenience of the user only and is not, and should not be considered to be, the official version of an ASOP. The American Academy of Actuaries does not warrant or represent that the web version of any ASOP is accurate and disclaims any and all warranties that are or might otherwise be applicable including, without limitation, any warranties of merchantability or fitness for a particular purpose. The official version of an ASOP is as set forth in the PDF version of the ASOP, which may be downloaded from this site. This document contains the final version of a revision of ASOP No. 34, Actuarial Practice Concerning Retirement Plan Benefits in Domestic Rela­tions Actions. ASOP No. 34 was approved by the ASB in September 1999. The ASB is issuing this revision to address concerns that the existing disclosure requirements in the standard do not sufficiently assist users in understanding large differences in the valuation results prepared by different actuaries. In addition, several actuarial standards of practice applicable to work with pension plans have been recently revised. In September 2013, the ASB issued a revised ASOP No. 27, Selection of Economic Assumptions for Measuring Pension Obligations. In December 2013, the ASB issued a revised ASOP No. 4, Measuring Pension Obligations and Determining Pension Plan Costs or Contributions. In September 2014, the ASB issued a revised ASOP No. 35, Selection of Demographic and Other Noneconomic Assumptions for Measuring Pension Obligations. Revision of ASOP No. 34 is necessary to provide guidance consistent with the guidance in these other actuarial standards of practice. The exposure draft of this ASOP was issued in September 2014 with a comment deadline of January 31, 2015. Five comment letters were received and considered in making changes that are reflected in this final ASOP. For a summary of issues contained in these comment letters, please see appendix 2. Section 3.3.4 has been modified to indicate that each assumption selected by the actuary should be individually reasonable and consistent with the other assumptions selected by the actuary, in accordance with ASOP Nos. 27 and 35. Section 3.3.4(b) has been modified to indicate that, unless another assumption is clearly warranted by the facts and circumstances, the actuary should select a mortality table with adjustments to reflect expected mortality improvement before and after the measurement date that, in the actuary’s professional judgment, reasonably reflects the expected mortality experience of similarly situated individuals. Section 3.3.5 has been modified to indicate that the actuary should not determine a life expectancy from the chosen mortality table and then compute the value of an annuity certain for a term equal to that life expectancy, as it may produce materially inaccurate results. Section 4.4 requires disclosure of a brief description of the rationale for selection of assumptions and allocation methods. The ASB voted in June 2015 to adopt this standard. the actuary should consider, document, and disclose when performing an actuarial assignment. The ASB’s goal is to set standards for appropriate practice for the U.S.
c. provides information to enhance understanding of the actuary’s role and responsibilities, and of the factors that may affect the measure­ment, allocation, or division of retirement plan benefits in domestic relations actions. This standard applies to actuarial services when performing actuarial services in connection with the measurement, allocation, or division of retirement plan benefits in domestic relations actions. This standard is not applicable to actuarial services performed in connection with other post-employment benefits, such as medi­cal benefits, that may also be considered as part of the domestic relations action. To the extent that the guidance in this standard may conflict with ASOPs of a more general nature, this standard will govern. If the actuary departs from the guidance set forth in this standard in order to comply with applicable law (statutes, regulations, and other legally binding authority), or for any other reason the actuary deems appropriate, the actuary should refer to section 4. When this standard refers to the provisions of other documents, the reference includes the referenced documents as they may be amended or restated in the future, and any successor to them, by whatever name called. If any amended or restated document differs materially from the originally referenced document, the actuary should consider the guidance in this standard to the extent it is applicable and appropriate. This standard will be effective for relevant assignments for which the actuary is first engaged on or after December 1, 2015. The definitions below are defined for use in this actuarial standard of practice. The determination, as of a measurement date, of the actu­arial present value of a retirement plan benefit and any related benefits. Benefits for which the amount or timing of benefit payments depends on the covered party’s age or length of service. The date through which the retirement plan benefits are deemed attributable to the marriage. Generally, this is the last day of the allocation period. A method used to determine the portion of retirement plan benefits that is included in marital property. The division of retirement plan benefits into two or more portions: a portion that is fully considered to be marital property and a portion that is not marital property, and perhaps a portion that is determined to be partially marital property. The period over which the retirement plan benefits deemed attributable to the marriage are determined. The period typically starts from the date of marriage or, if later, the hire date or plan entry date. The period typically ends at the date of marital separation, the date of court order formally ending the marriage, or the date of separation from service or actual retirement. The party in a domestic relations action who is covered by the retirement plan. A present or prospective client or employer who has the opportunity to select the actuary and is able to communicate directly with the actuary about the actuary’s qualifications, work, or recommendations. Prenuptial, postnuptial, separation, divorce, and support agreements, and other domestic relations proceedings. Federal, state, and local statutes, regulations, case law, and other binding authority that may govern the domestic relations action, the retirement plan or plans, or any other aspect of the actuary’s engagement. A court order dividing retirement plan benefits between the covered party and spouse, or a proposed court order for such purpose. The judicial officer presiding over a domestic relations action, or an arbi­trator, mediator, or special master acting in a similar adjudicatory capacity. Assets of the marital estate as determined under the laws and regulations of the applicable jurisdiction. The date as of which the actuarial present value is deter­mined. The measurement date may be different from the allocation date. An employment-related arrangement for determining the amount and timing of retirement plan benefit payments, eligibility for benefits, etc. A retirement plan may be a defined benefit pension plan, a defined con­tribution plan, or a hybrid plan with both defined benefit and defined contri­bution elements. A party to the domestic relations action who is not the covered party. Normally, the term refers to the current spouse or former spouse of the covered party, but may on occasion refer to a child (or children) or other party to the domestic relations action. Section 3 provides specific guidance for actuaries who undertake one or more of the following tasks in connection with a domestic relations action: performing an actuarial valuation and preparing the related report (section 3.3); participating in adver­sarial proceedings (section 3.4); providing guidance on the division of retirement plan benefits (section 3.5); assisting in drafting a domestic relations order (section 3.6); and assisting in reviewing or imple­menting a domestic relations order (section 3.7). e. a retirement plan sponsor, administrator, or trustee. The actuary should be alert to the possibility of a conflict of interest and should disclose any actual or potential conflict of interest to all known direct users. A conflict of interest exists whenever the actuary’s objectivity, or duty owed to a client or employer, is impaired by competing interests. A potential conflict of interest exists whenever it reasonably appears that the actuary’s objectivity, or duty owed to a client or employer, may be impaired by competing interests. For example, a potential conflict of interest exists when the retirement plan’s actuary is retained by the covered party, spouse, judge, or court. Similarly, a potential conflict of interest exists when the actuary has previously performed professional services for or has a personal relationship with the opposing attorney or any other party to the domestic relations action. In these matters, the actuary should be guided by the Code of Professional Conduct, Precept 7, Conflict of Interest. h. assisting the plan sponsor or administrator in reviewing or implementing a domestic relations order, including interpreting the pro­visions of the domestic relations order or providing actuarial advice as to whether a domestic relations order provides for definitely determinable benefits permitted by the retirement plan. The actuary should avoid the unauthorized practice of law. The actuary may rely upon the legal expertise of counsel or the court itself. The actuary should not provide advice in areas in which the actuary is not qualified. For example, normally it would be inappropriate for the actuary to advise a non-attorney whether a domestic relations order meets applicable procedural requirements to be a valid domestic relations order in the jurisdiction. It would, however, be appropriate for the actuary to advise whether the benefits provided by the domestic relations order are permitted by the retirement plan and whether each party’s benefit is definitely determinable from the domestic relations order. The actuary should have a general familiarity with domestic relations law that affects the actuary’s work product or opinion. If a conflict exists between this standard and domestic relations law, compliance with domestic relations law is not considered to be a devia­tion from this standard. An actuarial valuation is required to determine the value of benefits payable from a defined benefit pension plan that may be included in marital property. Defined contribution plans have individual account balances and usually do not require an actuarial valuation. However, an actuarial valuation may be required for a defined contribution plan if the time or form of benefit payment is restricted or the benefits are not yet fully vested. The goal of performing an actuarial valuation is to provide a reasonable assessment of the value of retirement plan benefits that are marital property. While an actuarial valuation may be used in drafting a domestic relations order, this section does not apply to reviewing or implementing a domestic relations order (see section 3.7). To prepare an actuarial valuation, the actuary should do the following: identify and collect the information required to determine the covered party’s retirement plan benefits; determine the measurement date; if applicable, select an allocation method, unless prescribed; select nonprescribed actuarial assump­tions; and perform the computations. Each of these steps is described in more detail below. d. allocation date and allocation period. The actuary may rely on information supplied by the attorney, plan sponsor, plan administrator, covered party, spouse, or plan record keeper, but the actuary is responsible for reviewing, when practicable, the reasonableness of the applicable data. In many instances, the measurement date is prescribed. When the measurement date is selected by the actuary, such date should be reasonable for the purpose of the measurement. When selecting an allocation method for an actuarial valuation of retirement plan benefits in a domestic relations action, the actuary should take into account limitations imposed by domestic relations law and the relevant facts and circumstances. The acceptability of a given allocation method may depend on the legal jurisdiction applicable to the parties involved in the action. The following provides the actuary additional guidance regarding the selection of an allocation method. 1. Direct Tracing: The portion of the retirement benefit that is marital property is equal to the actual benefit accrued during the allocation period. For example, in applying direct tracing to a defined benefit pension plan, the portion of the retirement benefit included in marital property could be the increase from the accrued benefit, if any, at the marriage date to the accrued benefit at the allocation date. 2. Fractional Rule: The retirement benefit is allocated by multiplying the retirement benefit by a fraction. The numerator and denominator of the fraction may be based on compensation, contributions, benefit accrual service, plan participation, employment, or other relevant data that are used directly in the determination of the accrued benefit. The numerator is equal to the selected measure accrued during the allocation period. The denominator is equal to the selected measure accrued during the total period in which the benefit is earned. When the selected measure is an elapsed time period, this method is commonly referred to as the time rule. Illustrations of the calculations involved in the above two methods are included in appendix 1. Variations of these basic methods exist. b. Age- or Service-Dependent Benefits: If the covered party has not satisfied the applicable age or service conditions for cer­tain benefits provided in the retirement plan but remains employed by the plan sponsor at the allocation date, the actuary should deter­mine how to allocate the age- or service-dependent benefit. Unless otherwise required by domestic relations law, acceptable approaches include the immediate termination approach, which values the benefit as if the covered party terminated on the allocation date; and the continued employment approach, which reflects continued covered employment in accordance with selected retirement, turnover, mortality, or disability assumptions. c. Different Results from Different Methods: Different types of allocation methods can produce significantly different results. An actuary working in situations where different methods might, in the actuary’s professional judgment, be appropriate should inform the client as to the implications of the method used as compared to other methods, including the general financial impact of each method. When selecting assumptions for an actuarial valuation of retirement plan benefits in a domestic relations action, the actuary should take into account limitations imposed by domestic relations law and the facts and circumstances of the valuation, including each relevant retirement plan’s circumstances and provisions; information about the covered party and spouse (see section 3.3.1); and past experience and future expectations for the group of which the covered party is a member. Each assumption selected by the actuary should be individually reasonable and consistent with the other assumptions selected by the actuary, in accordance with ASOP Nos. 27, Selection of Economic Assumptions for Measuring Pension Obligations, and 35, Selection of Demographic and Other Noneconomic Assumptions for Measuring Pension Obligations. The following sections (a–k) describe assumptions commonly used in valuing retirement plan benefits and factors that the actuary should take into account in selecting assumptions for valuing such benefits in domestic relations actions. This list is not intended to be all-inclusive; additional assumptions may be required depending on the provisions of the retirement plan being valued, specific circumstances of the covered party or spouse, and unique requirements of the jurisdiction. a. Discount Rate: Unless another assumption is clearly warranted by the facts and circumstances, the discount rate selected for valuing retirement plan benefits in domestic relations actions should be a low-risk rate of investment return, determined as of the measurement date and based on the cash-flow pattern of benefits being valued (for example, the cur­rent or a recent average yield to maturity on U.S. Treasury bonds of comparable duration, or a published index reflecting yield rates for high-quality corporate bonds). b. Mortality and Mortality Improvement Assumption: Unless another assumption is clearly warranted by the facts and circumstances, the actuary should select a mortality table with adjustments to reflect expected mortality improvement before and after the measurement date that, in the actuary’s professional judgment, reasonably reflects the expected mortality experience of similarly situated individuals. For example, assuming a 100% probability of death at a single age and zero at all other ages is not an appropriate assumption. In some cases it may be appropriate to reflect the health of the covered party or spouse in the selection of the assumption. c. Annuity Purchase: As an alternative to selecting a discount rate under section (a) and a mortality assumption under section (b), the actuary may assume the cost of the purchase of an immediate or deferred annuity contract with appropriate benefit features from an insurance carrier. This may be done by using an actual insurance survey or by reference to published tables that are derived from such surveys. 5. the covered party’s income level, job position, and family circumstances. Statements made by the covered party or spouse as to antici­pated retirement age may also be considered, but should not be given undue weight because such statements may be self-serving and the domestic relations action itself may alter retire­ment planning decisions. e. Cost-of-Living Adjustments: If the retirement plan automatically adjusts benefits for increases in the cost of living, the actuarial valuation should generally reflect expected future increases in benefits attributable to such cost-of-living adjust­ments. In some cases, it may be appropriate to make an assumption about future ad hoc cost-of-living adjustments. f. Disability Assumption: A disability assumption is generally not applicable unless facts and circumstances clearly warrant it. A disability assumption may be used if the retirement plan provides special benefits upon diability and if including a disability assumption would materially affect the valuation results. A disability table that is generally accepted for use in valuing annuities or pension benefits, or a table that reflects the expected disability experience of plan participants, is generally appropriate. However, in some cases it may be appropriate to adjust the disability assumption to reflect the health of the covered party. 4. retirement plan provisions such as the age and service required to receive subsidized early retirement plan benefits. h. Compensation Increase: While it is common for the actuarial valuation of retirement plan benefits in domestic relations actions to reflect compensation through the allocation date only, some methods, and some jurisdictions, require the actu­ary to consider future levels of compensation.The actuary should determine whether future levels of compensation are appropriate for the calculation..
i. Growth of Individual Account Balances: Some retirement plan benefits have components directly related to the accu­mulation of real or hypothetical individual account balances (including defined contribution plans, floor-offset arrange­ments, and cash balance pension plans). An assumption regarding the future investment return earned by the actual or hypothetical accounts may be required to value benefits under such plans. This assumed rate of investment return should equal the discount rate unless, in the actuary’s professional judgment, another assumption is more appropriate. j. Form of Payment: The actuary should take into account the degree to which particular forms of payment may be subsidized and requirements or restrictions of the domestic relations action as to form of payment that may be selected by the participant. The actuary may also consider statements made by the covered party or spouse as to the form of payment that will be selected. using mortality tables and interest rates that are updated regularly), an assumption regarding future conversion rates may be required. d. discount the expected payments determined in section (c) back to the measurement date, using the selected or prescribed discount rate. The actuary should not determine a life expectancy from the chosen mortality table and then compute the value of an annuity certain for a term equal to that life expectancy, as it may produce materially inaccurate results. In some cases, the actuary may be asked for an opinion of the “after-tax” actuarial present value of retirement plan benefits. If the actuary has sufficient training or experience, the actuary may prepare such calcula­tions even though the actuary may not be a credentialed tax practitioner. Responding to such requests will generally involve making a number of additional assump­tions, such as the potential rate of taxation of retirement plan benefit payments and the tax rate applicable to investment returns. Domestic relations law may specify or restrict the measurement date, the allocation date, the allocation method, some or all of the actuarial assumptions, or the process the actuary should use to select the measurement date, allocation date, allocation method, or actuarial assumptions. In other situations, the parties to the domestic relations action may stipulate or request the use of alternative measurement dates, allocation dates, allocation methods, some or all assumptions, or the selection process. In such jurisdictions or situations, the actuary should use the prescribed measurement date, allocation date, allocation method, actuarial assump­tions, or selection process. Each nonprescribed date, method, and assumption selected by the actuary should be reasonable and consistent with every other nonprescribed assumption selected by the actuary. The actuary may also choose to present results using dates, methods, and assumptions that, in the actuary’s professional judgment, are appropriate for the given calculation, in addition to providing the results using the prescribed dates, methods, and assumptions. The actuarial valuation should be reasonable and appropriate for the assignment. Unless the dates, methods, or assumptions are prescribed, or the facts and circumstances dictate otherwise, the actuary should generally use the same process to select dates, methods, or assumptions for all actuarial valuations in the same jurisdiction. Even though the actuary may be acting as an advocate for the client in performing an actuarial valuations, the actuary should not select dates, methods, or assumptions outside the range of dates, methods, or assumptions that the actuary would ordinarily use solely to accommodate the litigation position of the actuary’s client. If the actuary changes the selection process, the actuary should be prepared to explain the change from the actuary’s previous selection process in the same jurisdiction. e. report these findings to the client, including the actuary’s assessment of the reasonableness of the other expert’s opinion. The actuary should be aware that the parties may use these findings to form an opinion on whether to litigate or settle the issue of retirement values, and should therefore strive neither to minimize legitimate differences of opinion nor to magnify immaterial differences. The actuary participating in adversarial actions may be asked to submit work for review by another expert. The actuary should not submit work for review without the express consent of the client or the client’s authorized representative. The actuary should request guidance from the client as to the scope of material that may be disclosed. To the extent authorized, the actuary should be prepared to disclose the type of information described in section 3.4.1. Any authorized contact should be conducted in accordance with the Code of Professional Conduct, Precept 10, Courtesy and Cooperation. The actuary may be asked to participate in negotiations with another expert to identify any differences (see section 3.4.1), and, possibly, to settle on a compromise value to which the parties can stipulate, thus avoiding litigation costs. In such case, the actuary should request guidance from the client as to the scope of the actuary’s negotiating authority and the scope of material that may be disclosed. The result of such negotiation with another expert might be a suggested stipulation or a list of issues that remain unresolved. The actuary participating in adversarial proceedings may be asked to provide expert testimony. The actuary undertaking such an engagement should be familiar with, and comply with, all relevant actuarial standards of practice, including ASOP No. 17, Expert Testimony by Actuaries. Before providing expert testimony, the actuary should review data, materials, and documents that are relevant to the subject on which the actuary is expected to testify. d. showing the effects of different dates, methods, or assumptions. The actuary may be retained by an attorney or the court to provide guidance on alternative methods available for the division of retirement plan benefits between the covered party and spouse. In this situation, the actuary should be generally knowledgeable about (1) methods for the division of retirement plan benefits that are available in the jurisdiction; and (2) the types of domestic relations orders available for the division of retirement plan benefits under each retirement plan considered in the domestic relations action, and the differences between these various types of domestic relations orders (see Appendix 1 for a discussion of the types of domestic relations orders available). When retirement plan benefits are to be directly divided or assigned by domestic relations order, the actuary may be retained to assist in drafting a domestic relations order that will accomplish the desired division of retirement plan benefits. Such assistance may include providing sample documents and calculating benefits payable under different payment schemes. The actuary assisting in drafting a domestic relations order should take into account early retirement subsidies and ancillary benefits available under the retirement plan as appropriate and should recommend that the proposed language unambiguously define the benefit amount payable to each party and that relevant contingent events, such as the covered party’s death before retirement or the covered party’s retirement after becoming eligible for subsidized early retirement plan benefits, be appropriately considered. When retirement plan benefits are to be directly divided or assigned by domestic relations order, the actuary may be retained by the plan sponsor or administrator to assist in reviewing or implementing the domestic relations order, as described below. Services provided by the actuary may include interpreting the provisions of the domestic relations order or advising whether the benefits provided by the domestic relations order are permitted by the retirement plan and whether each party’s benefit is definitely determinable from the domestic relations order. The actuary’s communication of a review of a domestic relations order should state the scope of such review. For example, the actuary could indicate that the review is limited to an examination of the technical content of the domestic relations order and does not extend to the legal form of the domestic relations order. If the domestic relations order has substantive conflicts with the provisions or administrative procedures of the retirement plan, or the benefits are not definitely determinable, then the actuary should explain the conflicts and why the domestic relations order is not administratively feasible as written. To be a qualified domestic relations order, a domestic relations order must satisfy the qualification requirements of IRC section 414(p) and ERISA section 206(d). One of the requirements is that the division ofretirement plan benefits must be pursuant to a judgment, decree, or order under the domestic relations law of a state. If the domestic relations order being reviewed fails to meet the procedural requirements of the court, it may not be a valid domestic relations order. The question of whether the proposed domestic relations order meets the state’s procedural requirements is a legal one and is beyond the qualifications of actuaries who are not also attorneys. The plan sponsor or administrator responsible for implementing a domestic relations order may retain the actuary to determine the benefit amount payable to the spouse or covered party in the various forms of payment available under the provisions of the retirement plan, the domestic relations order, and other governing document(s). This may include determining the amount of actuarially equivalent optional forms of payment in accordance with the retirement plan provisions (including the retirement plan’s definition of actuarial equivalence) and any relevant domestic relations law. If the terms of the domestic relations order or retirement plan are ambiguous, if the retirement plan is silent, or if the domestic relations order and retirement plan conflict, the actuary may provide a good faith interpretation of the domestic relations order in light of the provisions and administrative procedures of the retirement plan. Such interpretation should be disclosed, and the disclosure should include an explanation of the ambiguities or conflict. In reporting the results of the actuary’s work, the actuary should take into account the background of the likely audience and should explain technical terms and concepts so that they can be understood by the likely audience. For example, a report made to an attorney experienced in the measurement, allocation, and division of retirement plan benefits in domestic relations actions might presuppose more actuarial knowledge than a report that is to be made part of the court record. The actuary should make full disclosure of any actual or potential conflict of interest to all known direct users. Such disclosure should generally occur before the actuary accepts the engagement or as soon as practicable after the date the actuary learns of the actual or potential conflict of interest, if later. n. the disclosure in ASOP No. 41, section 4.4, if, in the actuary’s professional judgment, the actuary has otherwise deviated materially from the guidance of this ASOP. e. the source of any prescribed measurement date, allocation date, allocation method, actuarial assumption, selection process, or other prescribed item that has a material effect upon the actuarial valuation results. Nothing in this standard is intended to require the actuary to disclose confidential information. Note: This appendix is provided for informational purposes, but is not part of the standard of practice. 1. Under the common-law approach, any particular asset is generally awarded to the party who contributed the asset to the marriage. In the case of retirement plan benefits, the entire retirement plan benefit is generally awarded to the covered party. Thus, there is generally no need for an actuarial valuation of the retirement plan benefit in a common-law state. 2. Under the community-property approach, all assets accumulated during the marriage are subject to division between the parties. This approach may require a monetary value to be placed on retirement plan benefits. 3. The equitable-distribution approach is a less rigid approach that gives some weight to assets contributed to the marriage and some weight to other criteria, such as the length of the marriage. This approach may require a monetary value to be placed on retirement plan benefits. In general, allocation methods used to determine the portion of the benefit payments that is marital property may be characterized as either direct tracing methods or fractional rule methods, as described in section 3.3.3 and illustrated below. In many jurisdictions, the allocation date and method have been established by domestic relations law; in others there is no legally prescribed approach, and the allocation date or method may be an issue in the domestic relations action. In some jurisdictions, domestic relations law prescribes the measurement date and certain actuarial assumptions, such as the discount rate, mortality table, and retirement assumption. Similarly, domestic relations law may prohibit the use of certain types of actuarial assumptions, such as a compensation scale or voluntary turnover assumption. In some jurisdictions, the process the actuary must use to select the assumptions is prescribed; for example, the actuary might be required to assume that retirement occurs at the age at which the retirement plan benefit is most valuable. In other jurisdictions, there are no legally prescribed or prohibited actuarial assumptions, measurement dates, or selection methods. Because of the widely divergent approaches prescribed by or available in different jurisdictions, it is clear that there can be no uniform national approach to the actuarial valuation of retirement plan benefits. In many parts of the country, the law in this field is still evolving, while elsewhere there are governing statutes or a substantial body of established precedent. Where choice of method or assumption is allowed by law, a wide difference can exist between the values computed by different actuaries—a difference that may be attributable not to errors on the part of either actuary, but to legitimate differences of opinion as to the appropriate measurement date, allocation date, allocation method, or actuarial assumptions. Alternative methods for the division of retirement plan benefits that are marital property may include the award of the retirement plan benefits to one party, with other marital property awarded to the other party, as well as the direct division of the retirement plan benefits of either party by an appropriate domestic relations order. a court order dividing benefits earned under a nonqualified retirement plan. For certain types of retirement plans, there may be no provision in the law to permit division or assignment by court order. The plan provides a retirement plan benefit equal to 1% of the final year’s compensation multiplied by years of service. Accrued benefits vest after 5 years of service, and participants are eligible to retire early at age 55 if they have completed 10 years of service. Normal retirement is at age 65. The covered party joined the plan at age 25, was married at age 29, and is age 40 at the allocation date. 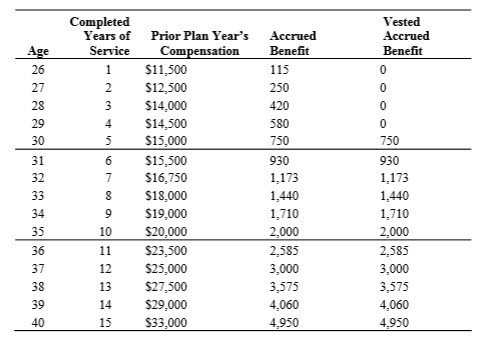 The covered party’s historical service, compensation, accrued benefit, and vested accrued benefit are shown in the following table. In the direct tracing method, the portion of the retirement plan benefit that is often considered to be marital property is equal to the actual benefit accrued during the allocation period (typically the period from the date of marriage to the allocation date). For example, in applying direct tracing to a defined benefit pension plan, the portion of the retirement plan benefit included in marital property would generally be the increase from the accrued benefit, if any, at the marriage date to the accrued benefit at the allocation date. If the direct tracing method were applied to the data given in the table above, subtracting the $580 accrued benefit at the date of marriage from the $4,950 accrued benefit at the allocation date would give the portion of the accrued benefit that is marital property: $4,370. Alternatively, the direct tracing method could be applied to the covered party’s vested accrued benefit. Under this approach, the entire $4,950 is marital property because the vested accrued benefit was $0 at the date of marriage. If the fractional rule method based on benefit accrual service were applied to the data in the table above, the $4,950 accrued benefit at the allocation date would be multiplied by the fraction (11 ÷ 15) because the covered party was married for 11 of the 15 years over which the benefit was accrued. The portion of the accrued benefit that is marital property is $3,630. If the fractional rule method were based on compensation instead, the numerator of the fraction would be compensation earned from the date of marriage to the allocation date ($242,250), and the denominator would be the covered party’s total compensation earned from employment date to the allocation date ($294,750). When the $4,950 accrued benefit is multiplied by the fraction ($242,250 ÷ $294,750), the portion of the accrued benefit that is considered to be marital property is $4,068. The fractional rule method allocates the retirement plan benefit by multiplying the retirement plan benefit by a fraction. The fraction may be based on compensation, contributions, benefit accrual service, plan participation, employment, or other relevant historical data. The numerator is equal to the selected measure accrued during the allocation period (typically the period from the date of marriage to the allocation date). The denominator is equal to the selected measure accrued during the total period in which the retirement plan benefit is earned. When the selected measure is an elapsed time period, this method is commonly referred to as the time rule. If the fractional rule method were based on compensation instead, the numerator of the fraction would be compensation earned from the date of marriage to the allo­cation date ($242,250), and the denominator would be the covered party’s total compensation earned from employment date to the allocation date ($294,750). Under both the direct tracing and fractional rule allocation methods, the allocation of age- or service-dependent benefits needs to be defined. Age- or service-dependent benefits are benefits for which the amount or timing of benefit payments depends on the covered party’s age or length of service. Subsidized early retirement plan benefits are often age- or service-dependent. For example, a retirement plan might provide that the benefit payable upon early retirement at age 55 is 100% of the accrued benefit if the participant has completed at least 25 years of service, and 50% of the accrued benefit otherwise. described above, including the value of the 25-years-of-service subsidy in marital property could double the value of the retirement plan benefit. As these examples illustrate, retirement plan benefits included in marital property can vary substantially depending on the allocation method used. The exposure draft of this revision of ASOP No. 34, Actuarial Practice Concerning Retirement Plan Benefits in Domestic Relations Actions, was issued in September 2014 with a comment deadline of January 31, 2015. Five comment letters were received, some of which were submitted on behalf of multiple commentators, such as by firms or committees. For purposes of this appendix, the term “commentator” may refer to more than one person associated with a particular comment letter. The Pension Committee carefully considered all comments received, and the ASB reviewed (and modified, where appropriate) the proposed changes. Summarized below are the significant issues and questions contained in the comment letters and the responses to each. The term “reviewers” includes the Pension Committee and the ASB. Unless otherwise noted, the section numbers and titles used below refer to those in the exposure draft. Click here to view Appendix 2 in its entirety.